Garth Wright was born on November 19, 1935, in the borough of Ipswich, England, and later became a naturalized American Citizen in 1955. He enlisted in the U.S. Army on February 3, 1954, and served as an infantryman until leaving active duty and joining the Army Reserve on February 3, 1956. PFC Wright received an honorable discharge from the Army Reserve on February 28, 1962, and entered Officer Training School with the U.S. Air Force on November 7, 1963. He was commissioned a 2d Lt at Lackland AFB, Texas, on February 4, 1964, and then completed training as a Security Police Officer before serving as a Weapons System Security Police Officer and Security Operations and Training Officer with the 42nd Combat Defense Squadron (later redesignated 42nd Security Police Squadron) at Loring AFB, Maine, from February 1965 to April 1968. His next assignment was as a Weapons System Security Officer and Assistant Security Operations Officer with the 35th Security Police Squadron at Phan Rang AB, South Vietnam, from April 1968 to May 1969, followed by service as an Operations Security Officer, Chief of Security Police, and then as Commander of the 7100th Security Police Squadron at Hindenburg Kasern and Wiesbaden AB, West Germany, from May 1969 to September 1971. 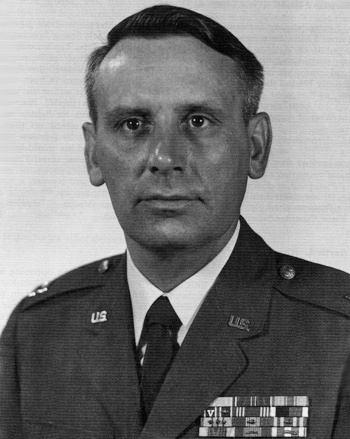 Capt Wright next served as Base Weapons System Security Officer with the 36th Security Police Squadron at Bitburg AB, West Germany, from September 1971 to January 1972, and then as Operations Officer and Commander of the 52nd Security Police Squadron at Spangdahlem AB, West Germany, from January to December 1972. He served with the 10th Security Police Squadron at RAF Alconbury, England, from December 1972 to May 1974, followed by service as Operations Officer with the 56th Security Police Squadron at MacDill AFB, Florida, from June 1974 to March 1976. Maj Wright next served as Deputy Director in the Directorate of Industrial Security and as Special Assistant to the Commander of Defense Contract Administration Services Region New York from May 1976 to May 1980, and then as Commander of the 46th Security Police Squadron at Peterson AFB, Colorado, from June 1980 to December 1981. He then served as Deputy Commander of the 90th Security Forces Group of the 90th Strategic Missile Wing at Francis E. Warren AFB, Wyoming, from December 1981 to May 1984, followed by service as Commander of the 93rd Security Police Squadron at Castle AFB, California, from June 1984 to July 1986. His final assignment was as Director of Security Police for 16th Air Force at Torrejon AB, Spain, from August 1986 until his retirement from the Air Force on September 1, 1988. The President of the United States of America, authorized by Title 10, Section 8742, United States Code, awards the Air Force Cross to Captain Garth A. Wright for extraordinary heroism in military operations against an opposing armed force as Security Operations Officer, 35th Security Police Squadron, at Phan Rang Air Base in the Republic of Vietnam, on 26 January 1969. On that date, Captain Wright was the key factor in repelling a highly trained and specialized North Vietnamese Army Company that was infiltrating Phan Rang. With professionalism, confidence, and extraordinary coolness under fire, Captain Wright organized and directed a blocking force that broke the attack. Walking into point-blank range of a heavily armed opposing squad concealed in the brush, Captain Wright, through fast reaction and exceptional skill, saved his men from possible annihilation and prevented the hostile forces from overruning the base. Through his extraordinary heroism and aggressiveness in the face of determined action by hostile forces, Captain Wright reflected the highest credit upon himself and the United States Air Force.